THE MODEL: A smart bicycle bell which is speed adaptive. The device has a fully automatic front light and navigation assistance for the cyclists. Also a cyclist can get to know from upto 400 meters if somebody has moved the cycle. Core Idea – A smart bicycle bell and app to helps cyclists. Product Features – A fully automatic and adaptive front light and bicycle bell. A 360 degree joystick is also provided. 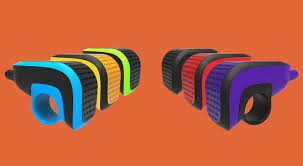 The device comes in multiple colours and offers users different ringing tones. The app helps track routes and monitor progress of cyclists. Data Syncing – The data from this app can be synced with other health and fitness apps. Getting Customers to Use the Product – Since most cyclists are already used to cycling without a smart bicycle bell, the extra value this smart bell provides as compared to its cost will need to be clearly articulated to potential customers to be able to get sales. Competition – Cycle companies are increasingly looking at accessories to differentiate themselves. There is a big risk of these companies developing competing product in-house.